Trying to collect these last three 2015 coins from the Walt Disney Resort has proven a little more difficult than usual. I’ve explained the past that I almost always have a friend or family member visiting Disney at some numerous times during the year. Or if not I check eBay or some other online merchants, but this has proven a little more difficult and I’m not sure why. It could be due to the total number of new coins, or that they are spread out all throughout the entire property not just in the parks but also in certain resorts. About a week ago I found an eBay auction with one of the last few coins I had been trying to acquire. I was able to win the auction and the coin arrived just this afternoon in the mail. 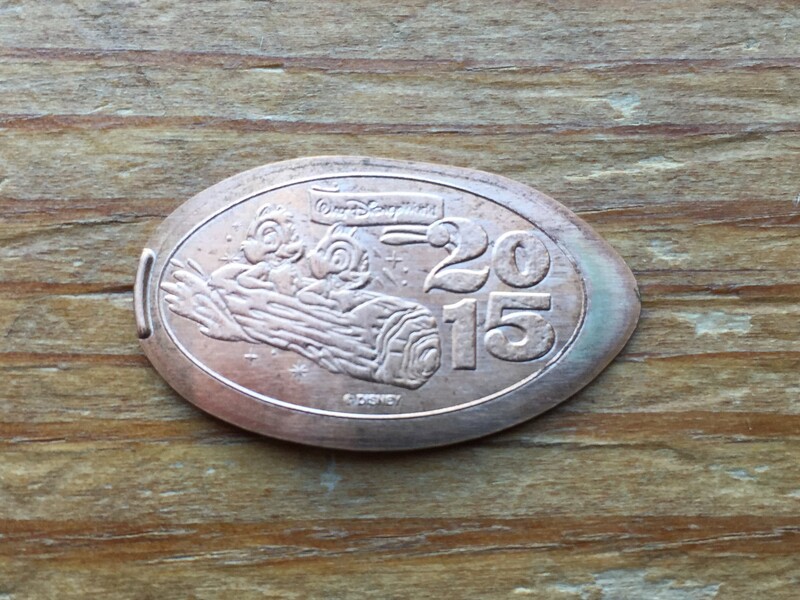 This design is on a penny and has Chip and Dale riding Splash Mountain with the 2015 year listed. The machine that has this design inside is located at the Splash Mountain gift shop near the photo preview area where the riders exit the attraction. 13 coins down and only two left. I’ve been keeping my eyes open for these last few designs but with just over a month to go until our family trip to Florida that may be the only way I can get these remaining coins. I can’t wait to get there and start pressing these coins.